Let's Do It for ME! : LDIFME bear meets.. The Let's do it for ME! bear has been out and about making new friends and raising awareness thanks to North East born performer, Jessica Robinson, who kindly invited him backstage at Middlesbrough's Little Theatre during her recent stint as Snow White in Snow White and the Seven Dwarfs. Jessica, 20, from Normanby, came fifth in the BBC programme Over The Rainbow, losing out on the lead West End role as Dorothy in Wizard of Oz to the eventual winner Danielle Hope in a sing off during the eighth live show. Jessica received great feedback from the judges with Andrew Lloyd Webber describing her as a "world class star". She described her involvement in the TV contest as “a brilliant experience” and remains dedicated to achieving her goal of performing in the West End. A big thank you to Jess for taking good care of LDIFME bear and helping to raise awareness with these great pictures. Backstage he also got to meet Bad Girls and Emmerdale actress Claire King, who starred alongside Jessica as the Wicked Queen. Bear wasn't scared at meeting the Wicked Queen, as he's a very brave little bear, but it did help that she wasn't wearing her fearsome costume. 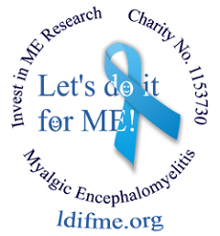 Thank you Claire for helping to raise awareness of the need for biomedical ME research! LDIFME bear was last seen at Middlesbrough station boarding a train to London with Jess, and her many bags of luggage, as she returns to London and to her 2nd year of studies at Arts Ed. He is hoping to meet up with some more famous faces soon..
LDIFME Bears are also available for adoption from our online shop.